I’m a little bit obsessed with hiding ugly things (examples: litter box, tv wires). A modem and wireless router is one of those setups that is so amazingly convenient–wireless internet!–but also so amazingly ugly. So years ago, before this blog was even a twinkle in my eye, I put them in a box. 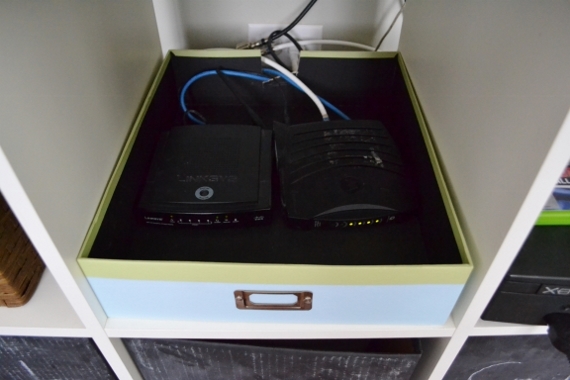 I took a large scrapbooking box, notched a space for the cords out of the back, and popped my modem and router in there. This setup has been working beautifully for at least the past 3-4 years. I can’t believe I’m only just now blogging about it! The only thing I’d do differently if I could would be to use a white box, seeing as this one has faded from the green you see near the top to the pale blue on the rest of the front. The sides and top are not so directly exposed to the sun and so they’ve faded less evenly. It looks fine the way we have it, though, inside a cubby and with a basket on top, so the fading is really no big deal. If you’d like to try this at home, this is the kind of box I used, but I’m sure you could find something similar at any craft store or maybe around your house. You could even just take a regular ‘ol cardboard box and paint it or cover it with fabric after cutting a notch out of the back for the wires, then just sit it on a shelf to look pretty and hide your gadgets. I love this!!!! I just may have to steal this idea. I added you to my “Blogs I Follow” on my own blog!!! Love reading. Do it! And thanks for sharing my link on your blog! It’s a lifechanger, I tell ya!